In 2016, St John’s College introduced the St John’s College Studentships Scheme to offer additional support to undergraduate students whose household income is less than £25,000. In the academic year 2018-19, the Studentships Scheme has been extended to include students from families with income up to £42,620. Home/EU fee status as determined in accordance with the Education (Fees and Awards) (England) Regulations 2007 (SI 2007, No 779) and meet the financial criteria mentioned above. The students in receipt of a St John’s College Studentship are still eligible to receive funding from the University-wide Cambridge Bursary Scheme. The studentships are funded entirely by recent donations from alumni and friends of the college who support St John’s aim to ensure that every student capable of studying and thriving here is able to do so regardless of their financial circumstances. The scheme will initially run for five years, during which the College will assess its effectiveness and financial sustainability with a view to continuing it in the long term. Students with a household income of up to £25,000 are eligible for the full amount of £6,810. Combined with the Cambridge Bursary of £3,500, the total amount of £10,310 is expected to fully cover the living costs at Cambridge during the academic year from October to June. For students with a household income between £25,001 and £42,620, the yearly award will be between £100 and £6,810. Please see some examples which give an indication of the amount of the Studentship depending on the household income. Who is eligible for the Studentships? The scheme is open to Home and EU students on undergraduate courses only, who are commencing their courses as first year students from October 2016, and if their household income is up to £42,620. MVST students will be eligible for a St John's College Studentship only during the first three years of their studies (pre-clinical studies). Anyone benefitting from the scheme must have been offered a place to study at St John's and they must have already satisfied the entry requirements of their offer in subsequent A-level examinations (or equivalent). If a year abroad is an integral part of their course at St John's, the students will be eligible to receive the Studentship during their year abroad, provided they meet the other requirements. For year abroad students, the College will also ask for information about any other potential funding they may receive during their year abroad and take this into account. How will financial eligibility be calculated? The College will base its financial assessment on Government Student Finance data. The basic measure, household income, refers to a family's income before tax but after pension contributions. In order to prove eligibility, students will need to apply to Student Finance for a Financial Assessment. The College reserves the right to ask for additional information and/or evidence if required, and potentially to withhold any award until all requirements have been satisfied. For the academic year 2018-19, Student Finance England base the assessment of the household income on the tax year 2016-17 for Home students and on the tax year 2016 for EU students. The same tax years will be used by the College for the assessment of eligibility for the Studentships. If a student’s income has decreased since then, we will consider a request for the income in the following year to be used for our assessment. Will eligibility for other forms of support be affected? 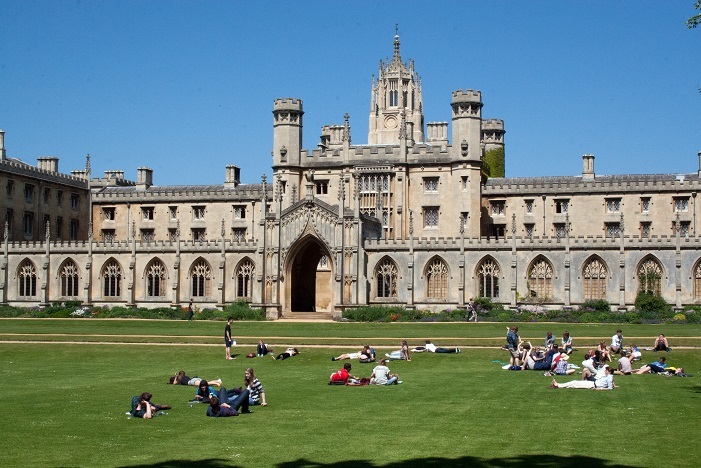 Students in receipt of a St John’s College Studentship will remain eligible for all other standard forms of financial support, including the University-wide Cambridge Bursary and other College support, for example grants from the Learning and Research Fund. Will I receive the Studentship for one year or for the duration of my studies? The financial eligibility for the St John's Studentship is initially assessed upon admission to the College and is reassessed in any following years of undergraduate studies at St John's. I believe that I am eligible - what should I do now? apply for a means-tested assessment to Student Finance England - or to the relevant body if you live in Scotland, Wales or Ireland. The procedure is the same as with the Cambridge Bursary so please review the information on the University’s website as well. Eligible students will also be asked to complete a form with financial information about their (or their family’s) income and submit relevant evidence to the College. Offer holders will receive the form from the College in the August preceding the commencement of their course. For any enquiries or to let us know that you may be eligible , please contact the Scholarship Administrator. Please note that the provision of fraudulent information in order to obtain a studentship, or any attempt to mislead the College in this regard, will be treated as a disciplinary offence and may result in serious disciplinary action by the College.